Every day is a good day for fresh pasta! One of my favorite memories as a child is making fresh tagliatelle with my grand mother. To me, she was the Queen of Tagliatelle! I still even have her pasta machine (more then 65 years old) and use it to make fresh pasta exactly the same way she taught me. I feel as if I can still hear her voice… But, now I use some little tricks to make it easier. Enjoy! You can either make fresh pasta by hand or with using a food processor. A food processor is great if you are short of time and want to avoid making a big mess. Add the eggs and the flour to the food processor, then add the salt and extra virgin olive oil. Start by pulsing the food processor to help mix all of the ingredients bringing them together. If the dough is too dry, add some spoonfuls of cold water. Once all the ingredients combine into a ball, take the dough out and knead with your hands until the dough feels soft and velvety. Then, let the dough rest for about 20 minutes at room temperature wrapped in a plastic wrap. Once the dough has rested, it’s time to make the tagliatelle. Cut off a small amount of the dough (about the size of your palm). Roll it through your pasta machine, starting on the widest setting. Continue to roll out the dough on this setting a total of four times while folding the pasta sheet in half and sprinkling with all purpose flour between each turn through the machine. Once you’ve rolled the dough through four times on the widest setting, move to the next setting (up or down in number depending on your machine, but it should be the next narrowest setting). Pass the dough through once, then change to the next narrowest setting. Move through the settings until your pasta is as thin as you would like. I usually pass the dough through four to five settings to get it thin enough. 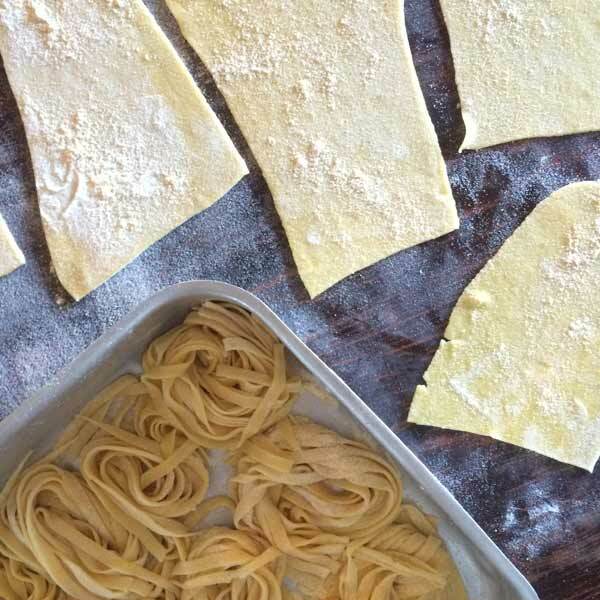 Remember to repeat the folding and flour sprinkling between each setting: lay out the pasta sheet on a countertop spreading some flour on top of it and let it dry as you keep doing other pasta sheets from the dough. When you have run out of dough, begin rolling the pasta sheets through the tagliatelle cutter. Take one pasta sheet and pass it through the tagliatelle cutter and catch it with your hands. Fold the tagliatelle in a ‘nest’ and place them on a floured surface to avoid sticking. Sprinkle the nested noodles with a dusting of flour to ensure they do not stick to each other as you continue working. Cook the pasta for 3-4 minutes in boiling salt water and drain well. Season with your favorite sauce and serve!